Ok, I know my picture is pretty hilarious, right? I’m obviously not an expert photographer, but hopefully learning! At least I gave my sisters a good laugh! 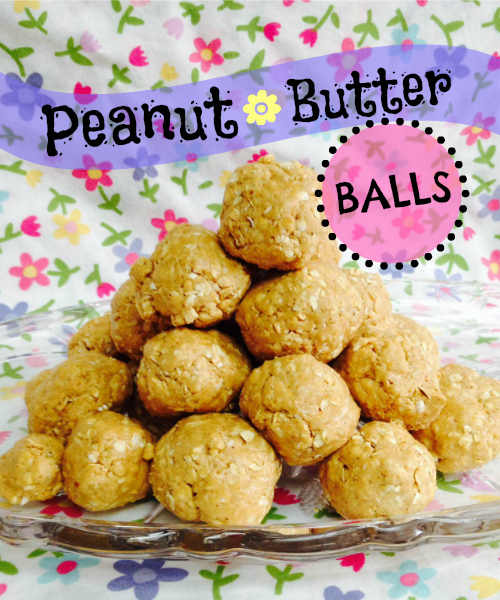 This super simple recipe for Peanut Butter Balls is one of my family favorites. I created it out of desperation one day when I remembered (last minute) that I was supposed to bring a healthy snack to our Cub Scout Pack Meeting that night. I found a couple of different recipes I liked, merged them together, did a little tweaking, and these were born. Since I didn’t have any fancy name for them, we just called them Peanut Butter Balls. (Hey, it works!) I was suprised at how many parents emailed me later to get the recipe because their kids were begging them to make them. I like to freeze them or eat them cold out of the fridge but my kids usually devour them right after I roll them into balls. Either way, they’re great! Roll into balls. Refrigerate or freeze for later. Other variations: Add some chocolate chips, replace oats with coconut. Peanut butter can also be replaced with almond butter. There are endless ways to change up these delicious balls. Be creative. Have fun! Enjoy!